It’s human nature to be concerned with how you measure up to others. So it’s no wonder that companies ask “what is a good Net Promoter Score” all the time. Of course, NPS ranges from -100 to +100 but what they really want to know is how they measure up: are they above, at or (worst case) below the benchmark. It may sound simple but this is a very difficult question to answer because so many factors can affect the score. For instance Net Promoter Scores can change, depending on how surveys are done, the industry, the country that the survey was taken and many other factors. We know in Australia the scores for Net Promoter are lower than the scores that we see in Europe. So finding good, representative benchmark information is difficult. While there are broad based independent reports providing information about NPS across industries using them, if you’re not directly represented, can be difficult. This is because of the factors noted above, especially how the surveys are done. 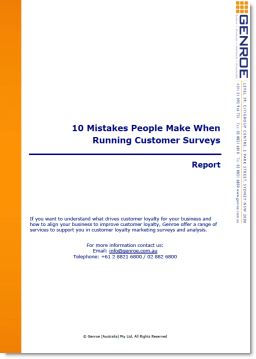 If you run your survey differently to the one in the report the numbers will not be a good benchmark. If you want an effective external benchmark for a good Net Promoter score you will need to run the entire process yourself, including surveying competitors. This can be expensive and time consuming. If benchmarking yourself, in an meaningful way, to your competitors is out of reach financially or logistically then the next best way is internal benchmarks. A good NPS is one that is better than you had last quarter, month, year. Here we define a “good” NPS as one that is continuously improving. This is a very effective technique that needs no outside support and lets you know you’re continuously improving your business. If you are continually improving your Net Promoter Score, then you’re likely to be continually improving your revenue and building your business long term. This type of internal checking of scores is the approach I recommend most to my clients. I suggest they focus more on changes in their own Net Promoter Score over the last six months or year than on looking at what the score might be, compared to other organizations or colleagues in other companies who are running Net Promoter Score surveys.